On June 11-12, 2018, Dr. Gary Banuelos, President of ISSR, Dr Xuebin Yin, Secretary General of ISSR, and Professor Dongli Liang, Chair of 6th International Conference on Environemnt and Human Health, held a table meeting in Suzhou to discuss the organization of 6th International Conference on Selenium in Environment and Human Health（SEHH）, which will be held on October 27-30, 2019 in Yangling/Xian, China. 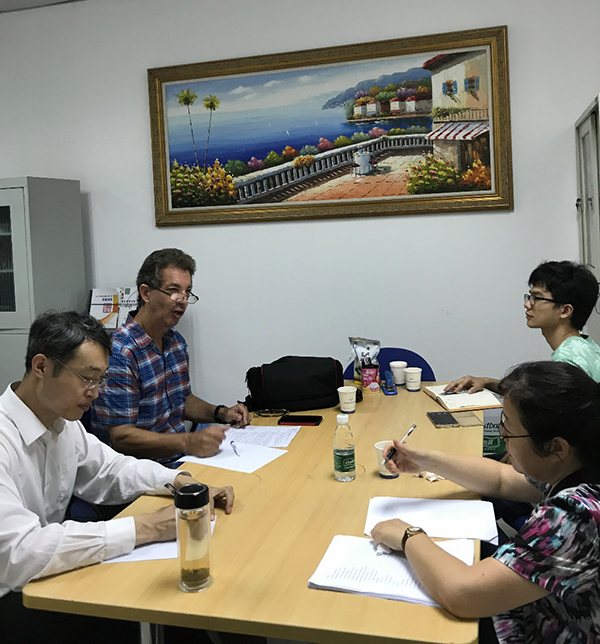 During the table meeting, registration fees, costs, number of participants, speakers, transportation logistics, peer-reviewed abstracts, conference activities, accommodations, student awards, and limited financial student support, were discussed. Suzhou Table Meeting on 6th Internatonal Conference on Selenium in Environment and Human Health. From left to right: Dr. Xuebin Yin, Dr. Gary Banuelos, Dr. Dongli Liang, PhD student Zedong Long.